Growing up in Fairview Park, Ohio, Anita Lalwani was a bookworm. 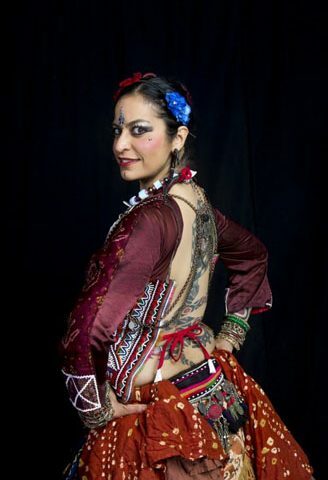 She tried tennis, skiiing, and even synchronized swimming, but it was not until she moved to San Francisco and met Carolena Nericcio that she fell in love with American Tribal Style® (ATS®) bellydance. Since then, she has devoted her life to helping others find happiness through movement. A certified yoga teacher since 2005, Anita currently teaches 4 vinyasa flow and 2 yin/restorative yoga classes per week at the Fitness SF gyms in the Castro and mid-market neighborhoods in San Francisco. In 2008, she added one-on-one personal fitness training to her workload, and currently averages 15 to 20 clients per week. Her clients range from young to old, injured to athletic, and businesslike to artsy. No matter what their goals, she gently nurtures them to honor the gift of the body by optimizing their posture and movement patterns. Anita has been dancing and teaching ATS® with FatChanceBellyDance® for well over a decade. Recent career developments include membership in the the newly-formed FCBD Teachers Collective and a video production on Yoga for ATS bellydancers. In her workshops and classes, Anita shares with her students her passion and belief in the transformative power of music and dance. ’As a dancer, it’s taken me a long time and on my dance journey, I have made every possible mistake you could possibly make. Let me help you understand and recognize that the mistakes you are making are a crucial component of your learning process. …And maybe I can help you avoid making the mistakes I’ve made!’ You can find Anita on Facebook (once in a while), on her website, AnitaLalwani.com (also rare), or out on the dance floor of life (yes, of course)!